The first of the deck fittings that I have cut out and started to assemble are the “bitts” that are placed either side of the main mast on upper deck. The kit only includes one set – however it is easy enough to cut out and make a second. Having cut out all the parts I forgot to photograph them before I assembled them. However here is a shot of another set for one of the other pairs of bitts on foredeck to give you an idea of what is involved. In the set I am making for upper deck, there are 5 layers of card, in all and this enables the pieces to be assembled creating the sheave holes in the uprights. 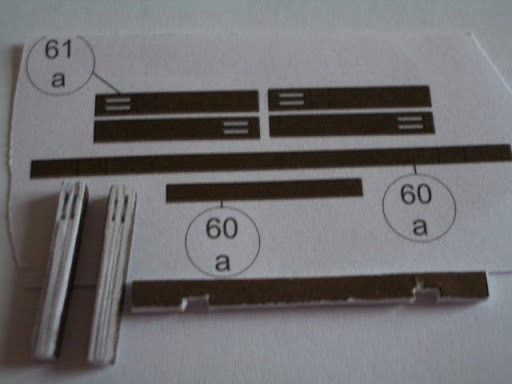 Once assembled this far, the idea is to then cut and apply a thin strip of paper over the edges (part 61a)– those are the parts shown that have still to be cut out from thin paper . There are 4 pieces still to be applied on the edges of the uprights, and the other strips go on the other horizontal part again to edge that in a similar manner. Once those pieces have been added and the piece assembled I shall give it all a coat of paint. 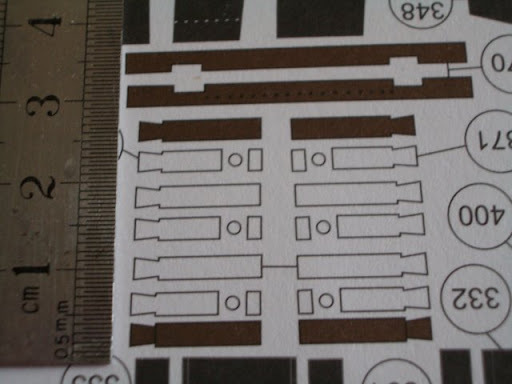 I intend to make up various deck fittings in their batches – once I have identified method for making assembling one I might as well make all the rest up that are similar, ie ladders, gratings, bitts and then have an en-masse batch painting session for – in this case brown - the appropriate colour. The pieces can then be stored carefully in an empty little box ready for installation at appropriate time. Blimey Chris, I have to admit that I would certainly bulk at attempting such a project as this! I would hazard a guess and say that building a card kit to the level that you are achieving is as exacting as any "wooden" build! Pete: When I first saw this kit - Jan 2008 - I baulked too at some of the little parts - but now what I have done so far does not seem too daunting. What does daunt me still is prospect of the little parts to make the lanterns as everyone else who I have seen has managed to cut out the little panes etc - but that is another problem and one for the future. Have you found a link to it somewhere?